OSWEGO, NY – A handful of speakers voiced their opinions Tuesday night on the Oswego City School District’s proposed 2011-12 spending plan. The speakers touched upon the specific things that Superintendent Bill Crist was expecting. The budget proposal for next year is about $3,000 less than the current budget. “It hit on the places that I thought it would. There was concern about the New Visions program (due to some misinformation about the cost of it), concern about the music program, the Study Skills class,” he said. 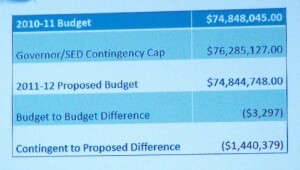 The superintendent’s proposed budget is $74,844,748. Terri Stacy urged the board to keep the budget cut that eliminates the New Vision program. The cost is a little over $8,000 per student for next year, the superintendent noted. “And, we get 70 percent of it reimbursed. So, it is only a few thousand dollar cost to the taxpayer,” added John Dunsmoor, chair of the board’s finance committee. There is still some consideration for some slots for the New Vision students for next year in cooperation with a BOCES program, Crist noted. Gisele Benigno urged the board not to make cuts in the music program. All of her children have benefited from what she calls the crown jewel of the Oswego district. A pair of students, Delaney Roddy and Sydnie Leroy spoke out in support of the study skills class. Cheryl Rogers, the K-12 team leader for music, asked the board to reconsider cutting a position from the music department that translates into the loss of a full–time high school band director. After the meeting, Crist said he doesn’t disagree with what was said. Referring to the study skills class, he noted that there are concepts people need to know about how to study. The district is still “banking” on some retirements; if they don’t happen it could impact how certain programs move forward, Crist said. Also Tuesday, after a bit of discussion, the board voted to put a bus proposition on the ballot this May. If approved by the public, Proposition No. 2 would enable the district to buy 10 new school buses at a cost of $968,000. The district is looking to acquire eight 66-passenger buses ($107,000 apiece), one 34-passenger bus ($48,000) and one 34-passenger bus with a wheelchair lift ($54,000). There was some good discussion regarding transportation, Crist added. Some of the district’s current fleet have 150,000 and 180,000 miles on them, and are getting expensive to maintain, the superintendent pointed out. Research shows that music instruction equals better grades, better attendance, better attitudes and overall higher self esteem. I have the utmost respect and gratitude for the music teachers my children have had so far…Mrs. Hotaling (KPS), Mr. Brewster and Mrs. Mckenney-Meyers (OMS). Their dedication and professionalism is second to none. Oswego is very lucky to have them and their counterparts. As far as the middle school study skills…it is invaluable to all students. Mrs. Smith has done a fantastic job broadening horizons for these students, and I believe along with the dynamic leadership of Mrs. Finnerty, has been an integral part of the middle school’s climbing academic success. Before the school board even thinks for half a second about raising taxes 2% – they need to cut the Director of Literacy, Director of Mathematics, and Director of AIS/Data Management from the school budget. Come on people, this is a joke. Taxes should not go up for the sole sake of keeping administrative workload at a low level. Put some more burden on the four individuals who make over six figures and have the “superintendent” or “assistant superintendent” titles. Taxes should not have to rise just to ensure that administrators are not inconvenienced with actually having to put in a day’s work. The positions we have now are high price but provide very little, if any, value. I agree. “Sacrifice” is the buzzword in public education lately. I do not see a lick of sacrifice from our administrators. Receiving a pay freeze is hardly a sacrifice when your salary exceeds $100,000. There is always room to do more with less when you look at administration. Amanda’s description of high price and low value is probably spot on! Do our superintendents and directors do anything productive to create a discernible benefit to kids or taxpayers? Not as far as I have ever seen!